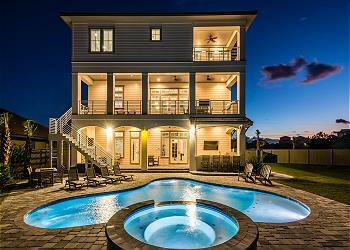 EXECUTIVE ACCESS: Gulf-front elegance awaits at 259 Open Gulf Street in Miramar Beach. 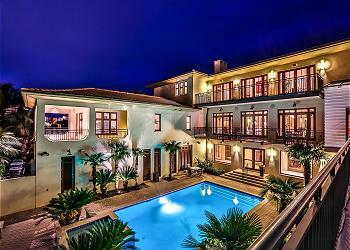 This exquisite home offers 7 bedrooms, 6.5 bathrooms, and accommodations for 31. Private beach access, expansive emerald coast views, and the sparkling private pool are just a few of the incredible highlights of “Kate’s Porch”. DETAILS: Four spacious and well-appointed levels in this home offer multiple areas to relax and enjoy the stunning ocean views. This uniquely designed home offers a first floor living area located steps from the pool area that is only accessible via the outdoor stairs.This floor features a lockout room with two-queen over queen bunk beds, a twin over twin bunk, and a queen sleeper sofa with a private bathroom and shower. The second floor features a generously sized living area, which includes an oversized sectional sofa, a mounted flat-screen television, a game table, and a large wet bar with seating for four guests. Step through the French doors onto the second-floor patio and experience the home’s spacious pool deck and stunning private pool. The sugar white sand beach is right outside the home and accessible via a private walkway. Three guest rooms with a variety of sleeping accommodations are also available on the second floor. The king bed guest room features a private bathroom with a shower. The second king bedroom features a shared bathroom with a shower/tub combo, and the bunk room includes a twin-over-twin bunk bed, a twin bed with a twin trundle, and a shared bathroom. On the third floor is the main common area, beautifully accented with warm wood tones, elegant rustic decor, and lavish furnishings. Guests will enjoy the chef’s kitchen, which features top-of-the-line stainless steel appliances, a Viking range, granite countertops, and lots of spacious custom cabinetry. In the nearby dining area, the large table offers seating for 10, and three additional seats are available at the breakfast bar. A large sofa, comfortable chairs, and a mounted flat-screen television create a relaxing place to unwind in the living area. Two guest rooms on this level each offer a king bed and private bathroom—one with a glass-front shower and the other featuring a shower/tub combo. The fourth level is dedicated to the luxurious master suite. Guests in this ultra-private room will wake up to unparalleled beach views, which can be enjoyed from the room’s sitting area or from the king bed. The private en suite bathroom offers a glass-front shower and a sink. Experience the beachfront elegance and modern luxury of “Kate’s Porch” at 259 Open Gulf Street in Miramar Beach. Contact 360 Blue today to book your stay! Had the most beautiful wedding at this house! We are so delighted that you had the perfect wedding at this home with us in Miramar Beach! We hope to host you again very soon!